Firstly, thanks to Mike Harris and Colin Pinks for organising this popular event, comprising a record four LX teams (with a few guests) from the whole age-group spectrum, and for using the splendid facilities of Clifton College (it’s the first time I’ve seen 4 astros (one a 3G) on one site in the UK). In their first match, the Artist(s) perhaps should have been awarded a penalty stoke, but they ran out losers to the Warhorse, courtesy of Lou Piscina following several inter-linking passes and Peter Witby pouncing on a loose ball at a short corner. Four goals were scored in the other 35 minute game with Brian Stokes, Rod Cochrane and John Tripp getting on the score-sheet for Wanderlust, two of the assists coming from Bob Grenside, and Project X replying with a typical Parmi Bolina goal. 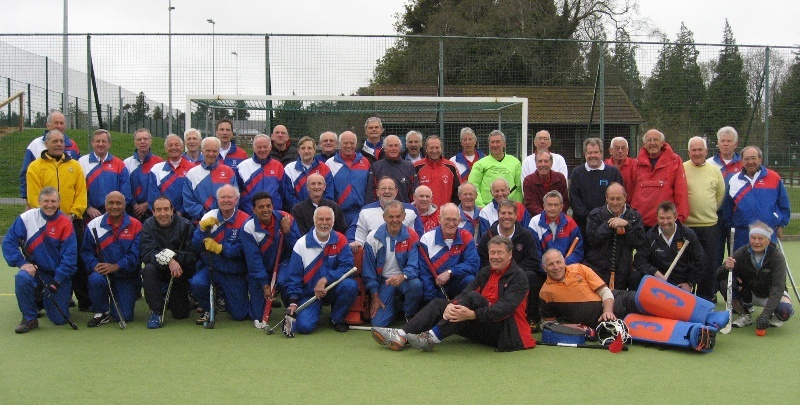 The two losing teams then played each other with Project X on the wrong side of victory again, although captain Brian Palfreyman said they had played well as a 10-man team, due to Sudesh Nayar’s injury, and felt they were the moral victors. Trevor Denison had a good game as usual. The Artist(s) actually won 1-0, with goalkeeper Bill Goodridge man-of-the-match, and captain Alan Muller reported that his side had missed two open goals before Winston Bower found the net from a John Smith cross. It was also the first time that Alan had actually played together on the same team with Alan Jackson, whom he has known since his early days at Trojans. The ‘final’ between Warhorse and Wanderlust ended with no goals being scored, and although Warhorse created more chances, the result was an honourable draw. Warhorse captain Ray Jeff thought that L Piscina, P Witby and Geoff Furneaux played particularly well throughout the tournament, and Wanderlust captain Mark Watson felt that John Tripp and B Greenside had good games for his team. Thanks to the umpires, Percy Steele, Chris Smailes and Mike Legg, and also to Mike Harris and Chris Jones who shared an umpiring and playing role. Finally, of course, thanks to the many wives who turned out in support, to help to make it a memorable day, with the added bonus of them being able to donate £100 profit from the sale of knitted scarves to the Oxford Grand Masters’ World Cup ‘fund’. Another equivalent date, Wed 27 March 2013, has already been fixed for next year! Warhorse: Ray Jeff (capt), Barry Sewell (GK), Peter Danson, Geoff Furneaux, Mike Harris, Leon Mack, Lou Piscina, Bill Greenwood, Peter Witby, Peter Ross, Marttin Palmer, Chris Jones. Wanderlust: Mark Watson (capt), Martin Ferrett (GK), Maurice Williams, John Tripp, Brian Stokes, Bob Jameson, Keith hunt, Bob Grenside, George Johnson, Rod Cochrane, Tony Perryman. Project X: Brian Perryman (capt), Mike Fripp (GK), David G Read, Richard Harrison, Colin Pinks, Brian Tubb, Michael Sprange, Sudesh Nayar, Parmi Bolina, Keith Montgomery, Trevor Denison. The Artist(s): Alan Muller (capt), Bill Goodridge (GK), Alan Jackson, John Smith, Winston Bower, Bob Purhouse, Jon Marshall, Phil King, Gilbert Grace, Adrian Money, Graham Martin.